You know, this makes the third Sonic the Hedgehog (hereby referred to as Sonic 2k6 from now on) review I’ve written in my lifetime. It is the second serious review I’ve written, with the first one reading more like a personal letter to SonicTeam themselves (believe me, they were dark times). So, really, what else is there left to say? A lot, apparently. With Sonic Unleashed so close to seeing release, my mind has been going back to Sonic 2k6 an increasing amount. Let’s get the obvious stuff over with early so we’re all on the same level, here: Sonic 2k6 was a bad game. A very, very bad game. If you have any sympathy towards the title or, heaven forbid, actually like the game, there is probably something wrong with you. Generally speaking, the only people who defend the title are folks who are too young (or too jaded) to understand just what this franchise used to represent. These are harsh words, I know, but I am harsh because I care. Sonic the Hedgehog used to be one of those powerful franchises like Mario – the sort of watermark series that helped to define a genre. In many ways, the Sonic of today is a hollow shell of what he used to be – what MegaMan became to Capcom, Sonic now is to Sega: Brand-name exploitation for fast, easy money. But it wasn’t always so immediately apparent with Sonic 2k6. The game’s initially secret behind-closed-doors technology demonstration was perhaps the most exciting thing to come out of the Sonic Franchise in nearly five years; not since Perfect Chaos leveled Station Square had there been something so impressive related to the franchise. The demo a showed huge, massive forest that seemed to go on for miles. There was intricately detailed ruins, beautiful graphics and animation, and plenty of character and style to go around – and throughout it all, Sonic never, ever said a word; no dated “That was tight!” skater-lingo here, just Sonic doing what Sonic does best: make robots explode. When said robots numbered in the hundreds (possibly even thousands) to surround Sonic and gun him down – presumably killing him, I audibly let out a “Whoa”. When Super Sonic rose and stormed that same army of robots, it was incredible. 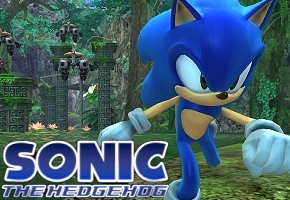 This was going to be a new beginning for Sonic, or so they said – when the game was announced, the President of SonicTeam Yuji Naka got up on stage and declared that they would be treating this title as if it was the original Sonic the Hedgehog on the Sega Genesis; they would be rethinking and redesigning the entire concept for this title. He resigned from the company halfway through the game’s development. Over the following months, we slowly learned that “rethinking” and “redesigning” translated in to “making another Sonic Adventure game”. The free-roaming “Adventure” portions of the game would be coming back, allowing Sonic to wander around the Italian-inspired city of Soleanna and talk to its citizens. As work on the title progressed, we learned that Shadow the Hedgehog would join Sonic on this quest, as would a new character – Silver the Hedgehog, who’s bizarre hair style and addiction to shiny chrome bits meant he had to be from the future (as required by law, stated in “Awful Character Design Rules & Regulations“, page 85). Though a disappointment, I remained optimistic – most people considered the original Sonic Adventure to be the best of the 3D Sonic games, and borrowing elements from that was something I could get behind. That’s not to say everything was borrowed, though – Sonic could now do sub-quests around town to make some extra money – money that could be used to purchase and equip new skills and items. Early gameplay footage sung the praise of a real-time day/night cycle, suggesting a seamless world; as you played, the sun would realistically rise and set, levels changing between day and night dynamically. Though the feature was an early focal point, after the initial gameplay demonstration, it was never mentioned again. Things kept going down hill from there. Talks of Sonic having a cross-species romantic interest, an increase in playable characters from 3 to 9, the utterance of the phrase “going back to his roots”, hands-on demonstrations showcasing a number of problems both large and small… but throughout it all, I maintained one, great hope: This was a game being created to celebrate Sonic’s 15th Anniversary. I was absolutely sure that there was no way Sega would use this game to celebrate a franchise landmark unless it was worth it. After the luke-warm Sonic Heroes and the abysmal Shadow the Hedgehog, this game would have to be the blue hedgehog’s return to form; a game to celebrate 15 years of Sonic games. If I saw a video of somebody playing the game and they were dying a lot, I simply assumed that they were bad at the game. When the demo dropped, most people who played it were unhappy with it. The problems were numerous, ranging from Sonic’s controls being too sensitive, camera controls not being sensitive enough, and numerous little collision detection issues and bugs. These too were ignored once word got out from Sega that the demo was based off of an “old build” of the game, one that was “not representative” of the final product. The problems people had with the demo were fixed in the current build, we were assured. The version of the game that shipped to the stores is best described as an unfinished mess. The whole game doesn’t feel like it’s been fully cooked in any regard whatsoever; to call it “rough around the edges” is being generous as the game borderlines on being totally broken at times. Most people I’ve spoken to about the game, including myself, got a game over on the first level in the game – not because it was difficult, but because the controls for the game really are that terrible. And while the argument could be made that, eventually, you “get used” to them – you wouldn’t want to. Even after you come to grips with Sonic’s wild sensitivity and the horrific “Mach Speed” sections of stages, you still must contend with the game’s numerous bouts of random slowdown, copious amounts of pop-in, not to mention countless bugs, glitches, and most importantly, frequent loading screens. Any time anything in the world changes, the game must re-load the entire level again from scratch, which can take nearly 15-20 seconds total – and there are sections of the game that will have you seeing four or more loading screens for merely seconds of gameplay. It is patently ridiculous. About the only part of the game that isn’t unplayable is the game’s soundtrack – of which contains some fantastic composition work, mixing techno, rock and contemporary styles to excellent results. In short, almost everything that came out of Sega’s Public Relations department regarding this game turned out to be a lie. In some ways, you can’t blame them – it is, after all, their job to sell you a product, and in that aspect they did their job successfully. On the other hand, not only has it taught me never to trust Sega’s PR, it has made me much, much more suspicious of all PR in general – especially in regards to Japanese games being promoted overseas, where PR agents may be working on outdated knowledge. By proxy, this also means I rarely trust previews of games, as well, as usually previews for games downplay negative aspects for a number of reasons – some of those being journalists being suspect to the same PR “No, really, it’ll be fixed before release.” line everybody else is. In the end, I don’t really need to tell you this is a bad game. In the two years since its original release, you no doubt know where you stand on the game and whether or not you like it – but, speaking personally, as Sonic Unleashed draws ever closer, I will keep my experience with Sonic 2k6 fresh within my mind, for no matter how good a game looks in promotional videos, the whole thing can fall apart the moment that controller is in your hands.